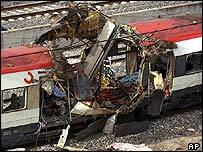 Spanish Prime Minister Jose Maria Aznar has said that those who carried out the Madrid train bombings will be punished. Ten bombs exploded on trains at three stations during the morning rush hour, killing 190 and wounding 1,200. 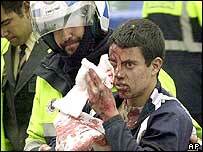 Mr Aznar made it clear he believed the armed Basque separatist group Eta was behind the co-ordinated blasts. But Interior Minister Angel Acebes later revealed that an Islamic tape had been found with detonators in a stolen van recovered near Madrid. The van was found in the town of Alcala de Henares - where three of the four bombed trains originated. The other train passed through the town. Mr Acebes said the tape - one of seven discovered in the van - contained verses of the Koran, in Arabic, relating to education. "Because of this, I have just given instructions to the security forces not to rule out any line of investigation," he said. However, the minister added that Eta remained the "main line of investigation". A political group close to Eta has denied that it carried out the attacks. Campaigning for Sunday's general election in Spain has been suspended, and three days of national mourning have been declared. In a televised address, King Juan Carlos described the bombing as "madness which has no possible justification". Expressing deep sympathy with the families of the victims, he said: "Your king is suffering alongside you, is sharing your anger and is confident that the rule of law will prevail so that these cowardly assassins will answer for their crimes". In his address, Mr Aznar urged Spaniards to take to streets in protest at the attacks on their capital - and some have already heeded this call. "Terrorism is not blind," he said. "These terrorists wanted to cause as much damage as possible. It is a massacre. They have killed many people simply for being Spanish." He added: "The criminals who have caused so many deaths today will be arrested... We will succeed in finishing off the terrorist band." "Terrorist band" is a term normally used by the government to describe Eta. Other government ministers - and much of the country's media - have explicitly linked Eta to the attacks. Spanish anti-terrorist sources quoted by the AFP news agency said the explosive used in the attacks on four commuter trains was of a kind habitually used by Eta. They said the devices appeared to have been set off by remote control. No warnings were issued ahead of the explosions. The BBC diplomatic correspondent Barnaby Mason says that if Eta was responsible, the simultaneous attacks mark an unprecedented increase in scale, ruthlessness and co-ordination. Some observers say the bombings bear the hallmarks of the Islamic militant network al-Qaeda, which has threatened revenge on Spain for its government's backing of the US-led invasion and occupation of Iraq. And the leader of the banned Basque political party Batasuna, Arnaldo Otegi, blamed "Arab resistance". "Eta has always issued a warning whenever it left a bomb to explode," he said, adding: "Spain maintains occupation forces in Iraq and we should not forget that it had a responsibility for the war in Iraq." The bombings are being described as the most deadly terror attack in Europe since Pan-Am Flight 103 was blown out of the sky by a bomb above the Scottish town of Lockerbie in 1988, and the worst in Spanish history. They struck between 0730 and 0800 local time (0630-0700GMT) as trains brought thousands of people to work in the capital. The main attack was at one of Madrid's major stations, Atocha, in the city centre. Explosions hit a train as it was entering the huge interchange shortly after 0630 GMT, while other blasts went off on a train as it was passing Tellez street just outside the terminal. Bombs also tore into carriages on trains at El Pozo and Santa Eugenia stations. "People started to scream and run, some bumping into each other," Juani Fernandez, a civil servant who was on a platform at Atocha when the bombs went off, told the Associated Press. "I saw people with blood pouring from them, people on the ground." Three other devices hidden in backpacks were defused by police explosives experts. Helicopters and dozens of ambulances ferried victims to hospitals, while appeals for blood donations were broadcast on national radio. "It was butchery on a brutal scale," said Juan Redondo, an inspector for Madrid Firefighting Department. "This catastrophe goes beyond the imaginable." Political and religious leaders across the world have condemned the attacks, with many describing them as an attack on democracy. US President George W Bush said it was a "vicious act of terrorism" and telephoned Mr Aznar and King Juan Carlos to express his condolences. "As the horror unfolded, Spain was left reeling"
A look at those convicted and acquitted over the attacks.